Arsenal vs. Chelsea : 3 January 2018. On London Underground trains and station platforms on the Piccadilly Line, there is a graphic poster – maybe not as stylish as those wonderful ones from the ‘thirties – extolling the virtues of that particular line, which wends its way from out in the west through London, heading east and then north-east and then north to its eventual resting place. It shows a train disappearing underground at Hammersmith, with all of the major tourist attractions to be seen en route annotated on a map, and it is evidence of that particular line – “the purple one” – hitting many of the main tourist areas. On the Hammersmith to Kings Cross section, especially from South Kensington to Leicester Square, there are certainly some sights to be seen. Museums, department stores, royal palaces, theatres, squares, cinemas, parks and more. It is the very centre of an increasingly visited London. Of course, just beyond Earls Court lies Stamford Bridge – on the District Line, “the green one” – while a few miles north of the stations of Kings Cross and St. Pancras, on into the darkness of North London, lies the Arsenal tube station, and with it not only Highbury, the former home of our opponents on the third day of 2018, but their gleaming new stadium too. The Chuckle Bus – the PD Line, “the white one” – had picked me up from work at 2pm and, by 4pm, it was parked in a side-street adjacent to Barons Court. The four of us – PD, Parky, Scott and I – waited in the coolness of the early-evening air and were soon sent hurtling underground as the Piccadilly Line train took us into town. The game was not until 7.45pm. There would be time for a little pre-match revelry, which is not always possible for a London midweek away game. The weather in the West of England had been spiteful during the day, with showers and strong gusts of winds. Throughout the day, the weather had been bleak enough to remind me of the infamous game at Arsenal in December 2013 which had resulted in my car – my Chuckle Bus, “the blue one” – getting stranded in several feet of water with me having to walk a few miles to reach home at 5am the following day, Christmas Eve. We soon reached our staging post. Piccadilly Circus was an electronic dream. Christmas lights strewn across Regent Street, floodlit shops, huge neon advertisements, excited tourists with cameras clicking. It was nothing compared to Times Square in New York or Shinjuku in Tokyo of course, but still pretty mesmerizing. I met up with Kyle from LA, who was still in town, giddy with excitement for more Chelsea football. At about 4.30pm, the five of us entered “The Queens Head” just to the north of Piccadilly Circus. The pub was snug and warm, a typical old-style London boozer. Pints of lager were ordered. I could relax. I had not enjoyed the first couple of days back at work after a ten-day interlude. Here was a chance to unwind. Just opposite was the site of a former pub – “The Devonshire Arms” – which I remember well from a Chelsea game against West Ham in 1987. I had traveled down from Stoke with a college mate, Bob, whose pal Kev was a barman in the pub. As luck would have it, it was Kev’s last day of serving in the boozer, and he started pouring us free beers. By the time we left the pub to head over to Stamford Bridge, we were bollocksed. At the time, it was the most drunk that I had ever been at football, and the game was a huge blur. Kyle had loved his Chelsea experience on Saturday. He watched from directly behind the goal and to quote him, had experienced “sensory overload.” I suspect it was quite a shock to be so near to the action. It would be akin to me watching my first ever baseball game at Yankee Stadium just four yards behind the catcher’s mitt. At 5pm, I headed back outside into the London evening. My friend of over thirty-six years Tullio – often featured in these reports – was in town with his wife Emanuela and their two daughters Sofia and Lou Lou. We had arranged to meet up, albeit only for a few minutes. My Italian friends had enjoyed a long day of walking around the sights but were full of smiles. It was bloody magnificent to see them again; the last time had been in their apartment in Moncalieri, just to the south of Turin, ahead of our infamous 2012 Champions League game. I quietly whispered to Tullio, with my head subtly nodding in the direction of “The Queen’s Head”, about him joining us for a quick pint. “Boh” is one of my favourite Italian phrases. It means that there is no answer to whatever question has been asked, and even if there was an answer, there would be no point in saying, whatever is done is done. In the ten minutes that we were together, football dominated our chat, and the three girls looked on in awe at our ability to talk football under any circumstances. I also mentioned that if Tullio had told me of his plans, I could have tried to get him a ticket for the Arsenal vs. Chelsea game. We laughed again and soon said our goodbyes. It was lovely to see him and his family once more. Back in the pub, there was time for more “Peroni” and a lot more laughs. This was a lovely time, another sweet spot, another great Chelsea moment. At just before 6.45pm, we set off for the last section of the journey. As we disappeared into the underground, I noted that Beethoven’s “Ode To Joy” was being played by a nearby busker. Kyle mentioned its appearance in Kubrick’s “Clockwork Orange” and, just as we walked through the into the ticket hall, I had nightmarish visions of being accosted by some “droogs”. I also had an equally nightmarish vision of having my eyes forced open to watch the dour and defensive Arsenal team of the early ‘nineties on a constant loop. On the train, the chuckling continued. At Holborn, on the platform, we spotted a few Chelsea faces. At Arsenal tube, there were random shouts of support for Chelsea but nothing from the Gooners. I had warned Kyle that the tube at Arsenal was like a rabbit warren, so much unlike the airy Fulham Broadway. Every time I revisit this particular stop I am reminded of my first-ever visit. I quickly gave Kyle the quickest of history lessons as we sped up to take a few photographs outside the still impressive façade of Highbury on Avenell Road. He was mesmerized by it all. The closeness of one of our great, huge, stadiums, to run-of-the-mill terraced houses. The clean lines of the stand. The sense of place. We then hot-footed it to the larger, but hardly greater, Emirates Stadium. After a bag search and a trial to find my place, I reached Alan, Gary and Parky with a few minutes gone. A quick check of the team. I noticed that all was quiet. Very quiet. After a few minutes, a few Chelsea were singing “empty seats, empty seats” but I didn’t see many. For a few horrible seconds, I had a flashback to September of 2016; God, it seems so long ago now. Our beloved Chelsea team was completely over-run and out-played, especially in the first forty-five minutes. In hindsight, of course, the game marked the turning point in our season. It was a huge game in our history. Few defeats have ever been doted on as lovingly as that one. I turned my attention to the game. “You haven’t missed much, Chris” said Gal. I have to admit, what with a combination of getting in late, a very low viewing position – row two – and the gnawing pain of knowing that I would be waking up at 4.45am in the morning for work after the drive home, I struggled to get to grips with the game in the opening moments of the first-half. But Arsenal appeared to be in control, attacking down Victor Moses’ flank in front of us at will. I lost count of the amount of times that Alexis Sanchez was allowed to drift in and attack space on our right. Mezut Ozil too, looking even more gaunt than ever, was often breaking into our box. It was as if we were allowing a special little show of Arsenal prowess just for the away fans only. I also hated the continuing – and eerie – quietness which had enveloped the stadium. I simply did not hear a single Arsenal song nor chant during the entire first-half. And that is truly shocking. I know I berate our own fans at Stamford Bridge for long periods of quiet, but this was on a different scale. How was it possible for nigh on sixty thousand people to make so little noise? After constant Arsenal probing – ooh, matron – the ball broke for Alvaro Morata in the inside left channel, and we held our breath as he sprinted clear. He inexplicably steered it past the far post. On the replay on the huge screen behind me, it looked even worse. Then, an Arsenal chance for the effervescent Sanchez and a goal seemed assured. Remarkably, his effort was saved by Courtois onto his near post and we watched, hating every second of it, as the ball struck the far post and then rolled back, mesmerizingly, into his arms. A sublime save by Coutois from Lacazette followed, and it was undoubtedly one of the best this season so far. Stupendous stuff. Chelsea were under the cosh, but a rare break resulted in a strike from Bakayoko and a save from Petr Cech. The Chelsea support, three-thousand strong, behind me and to my left and right, were surprisingly quiet for a London derby. I have noted similar quiet away atmospheres at the new Arsenal stadium on a few occasions now. There is never as much noise, I feel, as at White Hart Lane on our visits. Maybe we are quietened by the osmosis of watching among so many Goons. A yellow card by Jack Wilshere on Cesc Fabregas brought howls. A couple of half-chances were exchanged. Marcos Alonso’s free-kick in prime territory sadly did not test Cech. Just before half-time, a nice interplay involving Hazard and Fabregas resulted in the former Arsenal midfielder ballooning the ball high and wide. The first-half had not been much to write about, but it could have ended 2-2. At half-time, I wondered if my pre-match prediction of a 1-1 draw might prove to be right. We certainly began the livelier in the second-half. Hazard, after a nice run and set-up by Morata, went close. An Alonso header too. We were looking more focussed. 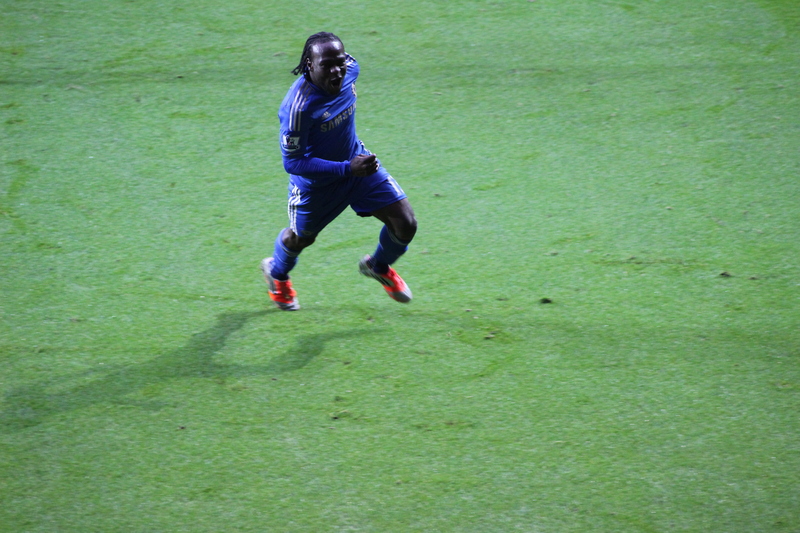 After ten minutes of play, the manager replaced Moses – a little under-the-weather – with Davide Zappascosta. A little Arsenal pressure followed, but I was full of praise of our three defenders, throwing their bodies at everything and hounding those carrying the ball. From my vantage point, it looked like Gary Cahill had cleared off the line. In front of the defence, Kante was magnificent, Bakayoko not so. A few more chances were exchanged. A Hazard shot straight at Cech. Just after the hour, a ball ran through to Wilshere and the ‘orrible little runt slammed the ball in. The stadium jumped to life at last. Until that point, I had still not heard a song, God’s honest truth. I looked around and I bloody hated them. Just four minutes later, Hazard danced into the Arsenal box down in our own special viewing gallery corner. He was up against Bellerin. His first cross was blocked but as he stretched to control the rebound, Bellerin caught his leg. We were level. There was my prediction. The game continued with us now looking the more confident and assured. A chance for Morata went begging, lifting the shot wide. Danny Drinkwater replaced Fabregas. A show of solidity. Oddly I felt, Willian came on for Hazard. Salvation came on eighty-four minutes when fantastic diligence from Zappacosta out wide after a great pass by Willian allowed him to slam the ball low into the danger area. To everyone’s surprise, it was the wing back Alonso who arrived – Lampardesque – to touch the ball past Cech. Our left-back ran towards us and was jumped upon by his team mates. It was a happy and glorious pile of blue in front of our corner of the Clock end. The away end was now the ones singing, and how. Down in the corner, Willian had a chance to hoof it away, but meekly cleared. Eventually the ball was played into the box and Bellerin slammed home after a header was knocked towards him. Amazingly, in the very last moments of the game, the ball was pumped behind the Arsenal back line and we watched again as Morata was one on one with Petr Cech. His unconvincing shot was smothered among cries of pain in the away end. The ball broke to Zappacosta. His heavy drive crashed against the bar. A draw, in all honesty, seemed a fair result. We had all said that a draw would have been fine before the game. We headed off into the night, with the feeling of what could have been. There was one word on every body’s lips. My lasting memory of the game, though, will be of the long periods of quiet in the Arsenal areas for the hour before their goal. And, I will say again, our support was far from noisy. For me, the lack of atmosphere really had a negative effect on the game. It is a common saying that “football without fans is nothing” but just as true is that “football without an atmosphere is nothing.” I can never remember an important away game against huge rivals being so bloody quiet, with a distinct lack of “crackle” that surely should go hand-in-hand with games under lights. It just didn’t seem to be that much of a spectacle. I found it difficult to get emotionally involved in it. It was a very odd night. Chelsea vs. West Ham United : 15 August 2016. As soon as I reached the familiar surroundings of the upper tier of the Matthew Harding Upper, I was met by the odd sight of many green tin foil flags being brandished by my fellow supporters. It was a bit of a shock to the system. “Green?” I asked Alan, who left the pub a little before the rest of us. “The Italian flag, mate” replied Alan. Ah yes. The Italian flag. It all made sense now. I looked over, past the green section and spotted silvery-white and red flags too. 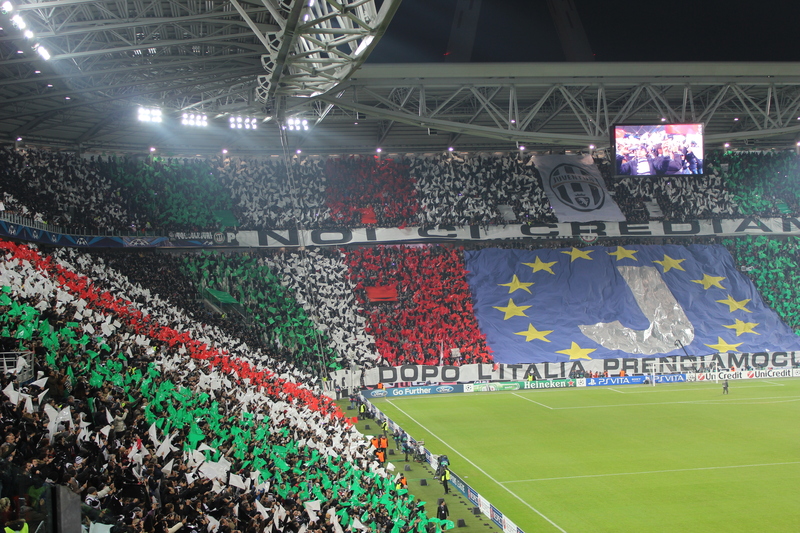 Once combined, the mosaic of an Italian flag was taking shape in the upper tier, while it seemed that fans – or at least some of them – in the lower tier had been given standard royal blue flags. An homage to our new manager Antonio Conte. Conte would be the latest in a revered and respected group of Italians who have managed our club. Gianluca Vialli. Claudio Ranieri. Carlo Ancelotti. Roberto di Matteo. Antonio Conte. In addition, we have had our fair share of Italian players too, from the idolised Gianfranco Zola and Carlo Cudicini to bit-part players such as Pierluigi Casiraghi, Sam Dalla Bona, Christian Penucci, Gabrielle Ambrosetti and Marco Ambrosio. It has always felt right, this Italian thing. The passionate azzurri playing with pride and passion in the royal blue of Chelsea. That there has been a strong Juventus link – Vialli, Casiraghi and now Conte – has made it all the more sweeter for me personally. It has evolved into a lovely subplot of my love affair with Chelsea over the past twenty years. Back in the August of 1996, I welcomed Di Matteo and Vialli to Stamford Bridge with my very own “VINCI PER NOI” banner draped over the MHU balcony wall against Middlesbrough, and I ended that particularly wonderful season at Wembley against the same opponents with an Italian flag adorned with “FORZA AZZURRI” as we won our first trophy since 1971. 1996/1997 was a season with a distinctive Italian flavour. And I wondered if the current campaign would be similarly seasoned. As the first weekend of the Premier League got underway without us, all of my focus seemed to be on our new manager, our new don, our new capo, our new “Mister.” After the ersatz atmosphere of the US tour, suddenly I was thrust right into the venom of a bitter London derby against West Ham United and I wondered how the new man would get us playing. This was the real deal, the real thing, the league opener, us against the world. After a torrid day at work, it took a while for me to fully focus on the evening’s game as I drove up to London, but once inside Stamford Bridge, the anticipation was rising. I was getting back in the groove. And the focus was certainly on Conte. I have mentioned already that I have a particular phrase for the new manager Conte which sums him up. It seems apt. Tons of passion too. Passion by the bucket load. That is fine by me. Passion is good. Passion is a good thing. Bring it on Antonio. Let’s get my Antonio Conte story out of the way early, although I have touched on it once before in these despatches. Back in 1999, I attended my friend Tullio’s marriage to Emanuela in their home city of Turin. It was a fantastic day, and evening, and night, and one of the nicest weddings that I have ever attended. Many beers were quaffed by myself (I honestly think they had got the beer in especially for me) and when I woke the next morning, I always remember my bloodshot eyes looking back at me from my hotel bathroom mirror. The wedding had been on the Saturday, and on the Sunday afternoon, I was to attend the Juventus vs. Fiorentina game at the Delle Alpi. It was perfect timing really. It could not have been better. Juve, with Thierry Henri playing for them – and Zinedine Zidane too, as a substitute – were a team of superstars and I watched high up in the stands, towards the home Curva Scirea, as Juve went a goal up. During the previous week, the same stadium had witnessed the visit of Manchester United in the Champions League semi-final, and the atmosphere during the game had not been great. But a win against bitter rivals Fiorentina would cheer the bianconeri after their defeat at the hands of Roy Keane et al. Sadly, the viola equalised late on. I had arranged with a local taxi driver to collect me outside the stadium at the final whistle in order to scoot me back to the city’s airport at the end of the game. I pondered if I should leave with a few minutes left in order to beat the crowds and possible traffic congestion. A little voice inside my head told me to hang on. Right at the death, who else but Antonio Conte – an industrious box to box midfielder – popped up inside the Fiorentina area to fire home. I watched, delirious, as he raced over to the segment of travelling away fans and picked up the corner flag and brandished it towards them. It was a perfect end to my weekend in Turin. Immediately after, Conte gained a great deal of notoriety within the Italian media for his actions, since many thought it confrontational, while in Juve circles he gained a great deal of respect. Incidentally, Conte was the Juve captain in those days and his manager on that day over seventeen years ago? Carlo Ancelotti. This is the Antonio Conte that I observed during the otherwise lacklustre Euros over the summer. This is the Antonio Conte that I want to see at Chelsea. Passion, fire, vigour, energy. God knows we missed these qualities last season. 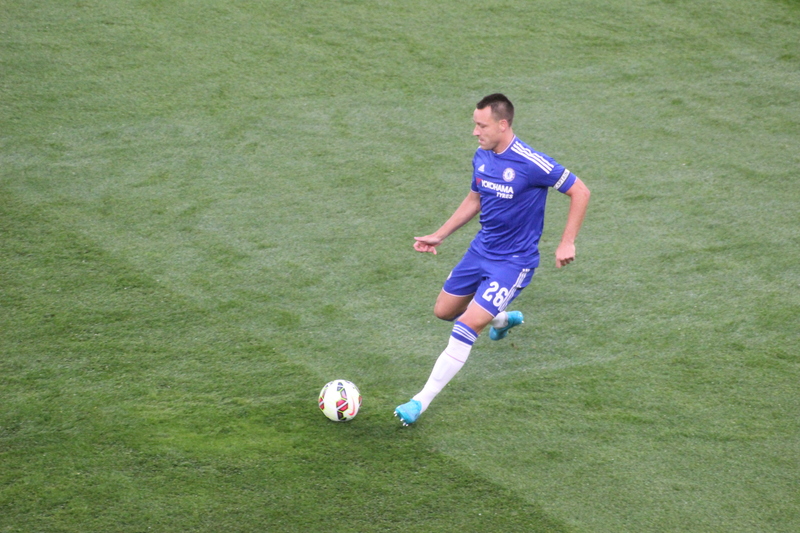 Azpilicueta – Terry – Cahill – Ivanovic. Willian – Matic – Hazard – Oscar. It was no surprise to me that his much vaunted 3-5-2 was not chosen. The players – his players – were not in place for that yet. If this is his preferred option, it will be a while before the team is morphed to a new shape. It is always a balancing act of players and formations, form and function. I trust that the new man will manage the changes with his apparent studiousness and professionalism. I certainly liked what I had heard about him; his Mourinho-esque attention to detail, his obsessive devotion to the game, his management style. It was a perfect evening for football. There was not a single cloud in the sky. Eight o’clock was approaching fast. By a strange quirk of fate, our first league game of 2016/2017 was another landmark game for me. Just over two years ago, I had driven Glenn, Parky and PD in the Chuckle Bus up to Burnley for our away game at Turf Moor – the league opener – for my one thousandth Chelsea game. Here, in 2016, two years later, I had driven the same three friends up to London for our league opener against another team in claret and blue for game number 1,100. A little coincidence there, for those that like them. Let’s hope that this season ends in the same way as 2014/2015, eh? (…incidentally, I don’t usually do predictions on here, but I had the top four for this new season as follows : 1 – Manchester City, 2 – Manchester United, 3 – Chelsea, 4 – Tottenham Hotspur). Over in the far corner, three thousand away fans were sat and stood, with more than the usual number of flags. Maybe they made a special effort. Elsewhere, Stamford Bridge appeared full, save for a few late arrivals in the top rows of The Shed. Familiar flags were spotted. As the teams entered the pitch, the mosaics in our end were furiously waved. Maybe I need to buy myself a retro away scarf of 1973 red, white and green this season. It was a grand old sight and I feverishly clicked away. I hoped that they would not be the most exciting snaps of the entire night. Flames were thrown up in front of the East Stand – just a little bit too much razzmatazz for my liking to be honest – and we watched as the teams went about their usual routines. It was then time for Alan and myself to make some comments about the tin foil flags in our midst. Chelsea in the traditional blue, blue, white, and West Ham in their traditional claret and blue. An opening game between two bitter rivals, just as in 2000 when Mario Stanic – remember him? – scored on his debut with a sublime volley, with a young Frank Lampard looking on. The game began – our season began – and we attacked the MH. West Ham began on the front foot, but there was a noticeable increase in the intensity shown by our players. It was hardly a new set of players – far from it – as all were on our books last season apart from the new lad N’Golo Kante, but it was remarkable how we easily noted an extra desire, passion and zip. Oh dear. I apologise now for the number of times I will write the words “passion” and “desire” this season. Sadly, Kante was booked early on for a tackle on Andy Carroll. I noticed how animated the new manager was. He had given up his grey training gear of pre-season for a dark grey suit, and black tie, and he certainly looked the part. His trademark stance seems to be him standing with one arm across his stomach, one hand up to his mouth, surveying all and sundry. West Ham were soon into their tiresome tirade of Chelsea-obsessed songs. Although the formation was officially 4/1/4/1, I couldn’t really spot much of a difference from last season’s shape. Matic seemed to be alongside Kante. Maybe there was extra width. Hazard was soon twisting away from markers, turning on a sixpence, and creating chances. Diego looked keen, yet still showed his propensity to dribble, head-down, rather than bring another players in. Matic began well. Kante really took my eye though. Tons of energy, and there is not that Matic-like tendency to dawdle once in possession. Of all people, Branislav Ivanovic, ghosting past his man, provided the first real chance for us this season, but his firmly-struck shot went narrowly wide of the near post, forcing a low save from Adrian. We got in to the game. Another Ivanovic shot was hardly worthy of the name. We knew that Carroll would be a problem, but were also thankful that their star Dmitri Payet was only on the subs’ bench. Oh, while I am on the subject : “Achy Breaky Heart” at football. West Ham were stood in the Shed lower, but many chose to sit in the upper. There was not a great deal of noise from them. Oscar went down after a clumsy challenge in the box, but neither Alan nor myself were too convinced that it was a penalty. Chances were at a premium to be honest. Diego was booked amid protests after. It was beginning to heat up. Eden Hazard proved to be our talisman again and he burst through on goal but a fine shot was narrowly wide of the mark. How I love to see Eden tease his opponents. Often he slows and almost walks towards them, a hark back to the tricky tanner ball players much beloved in Scotland, the intricately skilled wingers such as Davie Cooper, Jimmy Johnstone, John Robertson, our own Charlie Cooke and Pat Nevin. Often Eden will almost lower himself, a crouch, in order to concentrate his thoughts on how to get past his marker. It is one of modern football’s most wonderful moments. Eden versus his man. What will he do next? I heard myself saying to Alan “how does he do that?” as he effortlessly swept past a defender. What a player he is when he is in the mood. Diego fired over, but chances were still rare. It really was all Chelsea. West Ham were poor. They surprised me. Late on in the first-half, Willian forced a save from Adrian from one of his trademark dead balls. Dave headed the resultant corner over. All level at the break. We were treated to Ricardo Carvalho at half-time..
No complaints at the interval. PD, Glenn, Alan and myself – who sit all together – were happy with things. I never like it when we attack The Shed in the second-half. It seems odd. Out of kilter. However, we were all howling with pleasure after Dave was bundled over just inside the box after a shot from Diego came back into play. We were 1-0 up and the stadium was alive. We continued to press and Willian went close. West Ham, again, as if to ratify further, were nowhere. For a while, we turned the tables on West Ham, and there was a prolonged Frank Lampard songfest. Gary Cahill chased down a West Ham attacker and made a lovely defensive tackle. Alan and myself spoke how Conte’s intense training sessions over the summer may be bearing fruit already. It was a good simple, clear sign that we were a far more focussed, fit and forceful team in this season’s opener. They were handing out free tins of “Carabao” before the game but I am sure that the team’s vim was not due to this new energy drink alone. Conte had got the team playing and how. The game continued, again with only a few chances. Eden began to tire a little. Willian was having a quiet game. Matic slowed – if that is possible. Payet, the danger man, came on. Dave was adjudged to have raised a foot to Carroll, whereas it looked to us that the West Ham totem pole had stooped. From the free-kick, Payet forced a save from Thibaut. From the corner, we blocked the initial effort on goal, but the ball rebounded to ugly bald ginger goon Collins who slammed home. Their first effort on goal. Billericay Dickie, Dagenham Dave and Plaistow Patricia were making all the noise now. Conte is not the typically cautious Italian and he soon replaced the quiet Willian with Pedro, always a willing worker. Soon after, further attacking intent with two further substitutions; Batshuayi on for Oscar, who had shown a lot more bite than of late, and Moses on for the tiring Hazard. This was the fabled 4/2/4, and we pushed and pushed. A forceful run from Moses, followed by a fine volley from Pedro, but his low shot flashed agonisingly past the far post. In the very last minute, a ball was pumped up to the new lad Batshuayi who managed to head on towards the waiting Diego Costa. Costa was a good thirty yards out, and had a lot to do, but West Ham seemed reluctant to close him down. With space ahead of him, Diego had time to stroke a shot towards goal. The ball hit the target and we erupted. Diego ran on down to Parkyville, but my photographs of his intense celebrations were too blurred, too fuzzy. 2-1 to us, oh you lovely man Diego. It was not Tottenham last season but it was bloody close. The stadium echoed to an old favourite. “And it’s super Chelsea, super Chelsea FC” and The Bridge was on fire. A last chance – their second of the match? – fell to Carroll, but Thibaut fell on the ball and we could breath. The whistle blew and we yelled our joy. The manager’s emotional response to the winner was shown on the TV screens. Oh my goodness. This was a fine feeling alright. The boys were back in town and the new man Conte had pulled the strings to engineer a lovely win. “One Step Beyond” boomed and we bounced out of the stadium in very good spirits. The feel good factor was back. It felt oh-so good to be a Chelsea fan again. A new love affair has been ignited. Let’s go. See you all at Watford on Saturday. Swansea City vs. Chelsea : 3 November 2012. A day of international travel and unintelligible road signs, of wild scenery and heavy industry, bright sunlight and then darkening skies, rainstorms, hail stones, police cars, wailing sirens, lightning and fireworks. But, sadly, no three points for Chelsea Football Club. During the week, I had been toying with ideas of what to do before the game. If the weather held up, I had plans to venture further west; past Swansea and on to see the beaches of the Gower peninsula. Maybe take a few photographs. I contemplated a pub lunch overlooking the sea. On these football away days, I’m always keen to try something different for a change. Last season, on the last day of January, during the death throes of Andre Villas-Boas’ reign l, Parky and I had a grand day out in Swansea. We spent an enjoyable couple of hours on The Mumbles, the bay side area just to the south of the city, before heading up to the Liberty Stadium for the game. Initial thoughts on the Saturday were that we were in for a day of wind and rain. Sadly, it would seem that the beaches would have to wait until next season. At 9.15am, with the weather swaying from brooding clouds one minute and bright sunshine the next, I left my home in East Somerset. I sent a single text out to my mate Alan. And so a day of Welsh accents and Welsh stereotypes, Welsh phrases and Welsh jokes began. Depeche Mode accompanied me on my first twenty miles, but The Jam took over as I headed through Bristol. To be fair, the weather was surprisingly good. As I drove up on to the M4, the visibility was magnificent. At the crest of an incline, the twin bridges over the River Severn and the black hills of Wales were clearly visible to the west. All was good with the world. It looked like the weather was holding out and I’d soon be in Swansea to see the European Champions. Once over the river, a sign welcomed me to Wales. I paid the £6 bridge toll. Paul Weller was singing about bombs in Wardour Street and then tube stations at midnight. The Chelsea army was invading Wales and it felt good. I skirted the town of Newport / Casnewydd as I played a Massive Attack CD. I was happy to hear two of my favourite female singers, Elizabeth Fraser and Tracy Thorn, featured. Heading past the capital city of Cardiff / Caerdydd, the weather was still holding firm. However, it was too late to change my plans. Instead of spending some time to the west of Swansea, I was going to spend a little time at an outlet mall to the east. At 11am, I veered off the M4 at Bridgend and did some snappy shopping. In the “Berghaus” store, I typically spotted a fellow Chelsea supporter, who sits a few yards from me in the MHU, who had similarly been tempted with some retail therapy. With two shirts plundered, I continued west. Heading over another crest of a hill, a startling vista opened up in front of me. Away in the distance were the smoking chimneys and the ugly buildings of the Margam steel works to the immediate south of Port Talbot. Beyond, there was the broad sweep of Swansea Bay. I even spotted the lighthouse at Bracelet Bay, away in the distance, where Parky and I had enjoyed some fish and chips and a couple of pints of Grolsch in a seaside café last season. However, there were now clouds above and the mood suddenly became gloomier. On the long straight of the motorway which bordered the steel works, I spotted that the other carriageway was devoid of traffic. There was a police car strategically placed on a bridge. The busy road had recently been closed to vehicles. I wondered what lay ahead. As traffic slowed, I saw another police car parked on the bridge, with two police officers scrambling down the embankment. On the paving slabs, some way from the motorway, was the body of a man. As further police cars hurtled towards the scene, sirens wailing, I wondered if I had seen a dead body for the only the second time. I hit some traffic as I approached Swansea / Abertawe city centre. I turned right at the “Swansea Jack” pub and was soon parked up. It was 12.15am. Alan, Gary, Daryl and Rob were already enjoying a few beers in the Grand Hotel opposite the main train station. I battled against Saturday shoppers and a cold wind to join them. I had forgotten how hilly Swansea was. Terraced streets appeared to be layered one on top of the other. I had only been inside the small bar for a couple of minutes when Van Persie shot United ahead at Old Trafford against Arsenal. The game was being shown on the TV, but not many people were watching intently. Van Persie always seems to be able to hit the corners of the goals when he becomes within range. In a flight of fancy, I wondered how he would fare at the tip of our team, instead of the hit and miss Fernando Torres. Daryl reckoned with only a hint of exaggeration that he would end up with fifty goals in our team this season. On that matter, we were united. We had heard on the grapevine that a few hoodlums had travelled down by train but had alighted at Neath, no doubt expecting a little altercation with the Swansea firm. I rolled my eyes to the sky. With the bar getting busier and busier, I excused myself and re-traced my steps to the car park. I needed to drive up to the stadium and locate the “free” parking space that I used in January. Around 200 Chelsea fans were silently staring at the closing minutes of the game from Old Trafford, like the members of some obscure sect, their faces blank, the children of the damned. Watching Manchester United and Arsenal will do that to you. Inside the neat stadium, my eyes seemed to be drawn to the sky even though the teams were gong through their pre-match routines on the pitch. One moment, the rectangle above was a dull grey, the next it was a mixture of blue and white. At times during the afternoon, the stadium was lit up with a strange and surreal autumnal glow. The Chelsea team was announced and the main talking points were the shuffling along of Ivanovic into the centre of the defence and the addition of Moses in place of Mata. It wasn’t much of a game. In fact, it was a half-hearted affair all round. For the first time that I can remember for quite some time, I sat for the vast majority of an away game. Swansea City are a fine team and, despite a few poor performances, the work that ex-Chelsea employee Brendan Rodgers started is being continued by Michael Laudrup. I was looking forward to seeing the former Juventus player in person once again. I last saw him playing for Juventus in 1988-1989. They used to call him “Michaelino” in the city of Turin. And there he was, over to my right, sitting on the Swansea bench, just beyond the suave figure of Robbie Di Matteo who was patrolling the technical area. It is the exact opposite journey which ex-Juventus legend John Charles made all those years ago. Swansea had the best of the opening twenty minutes and certainly fancied their chances down our left, where Ashley Cole was coming under attack from the raiding Swansea players and the supporters in that noisy corner section alike. Eventually, we got into the game, but struggled to do much with the ball. Our passing should have been aided by the slick Welsh turf, but our play was rather laboured. The home supporters, especially the couple of thousand to my left, were roaring the home team on. On the occasions where they sung the quasi-Welsh national anthem “Land of my Fathers”, the stadium rocked to its foundations. I have a feeling that the upward slope of the roof greatly aided the acoustics. I’ll be honest. It was a bloody noise. Well done Swansea. The Leeds United chant echoed around the away end. In fact, at times, with Swansea in their trim all-white kit, it felt like we could easily have been playing Leeds. Hernandez and Michu caused us a few problems but Petr Cech’s goal wasn’t really threatened. A Torres header, weak and at the reserve ‘keeper Tremmel, was our most notable effort of a poor opening period. As the first-half continued, the Chelsea fans became quieter and quieter. At the break, we all knew we hadn’t been playing well. Ramires replaced the rather one-dimensional Romeu at the break and our little Brazilian certainly energised the midfield. We watched eagerly as Torres twisted one way and then the other and then picked out Victor Moses, quiet until then, with a fine chip. Unfortunately, our new signing headed over. Swansea then came into the game again and our defence was tested. After a decision went against them, the Swansea supporters sang a ditty which I honestly haven’t heard, let alone during a game, for years and years. On the hour, a free-kick from Hazard was turned around the post for a corner. Oscar, wearing a pair of royal blue gloves to the consternation of Gary, clipped in a ball which found the head of Gary Cahill. The ball flew goal wards, but Victor Moses was able to glance it in at the far post after reacting very quickly. I caught the immediate aftermath of the goal on camera. I was right behind the goal, merely twenty yards away. The turn and sprint towards us, the slide, the scorer beaming at us in the away enclosure, the sliding Gary Cahill, Cahill jumping on his back, the arrival of the ecstatic Torres and Ivanovic, then Ramires and Mikel, then the other players all joining in. Swansea countered again, aided by the nimble and gifted substitute Nathan Dyer. The manager replaced Moses with Daniel Sturridge, who hugged the right touchline for the remainder of the game. In the closing twenty minutes, the rain turned heavy and then the sky filled with hailstones. It was quite an apocalyptic scene. The ice filled the air and turned it white. Chelsea were now under attack. Ryan Bertrand replaced Oscar. Alas, with just three minutes remaining, a fine move down the Swansea right resulted in Hernandez having the calmness of mind to slot the ball past an unsighted Cech. The Swansea hordes boomed and “Land of my Fathers” shook the place to its foundations. We didn’t deserve anything more than a draw. After the two tumultuous games against Manchester United, we never really set the right tempo against Swansea. Too many players underperformed. There was a collective responsibility in the team’s deficiencies. Even us fans seemed subdued. We were all, clearly, under the weather. I bade my farewells to Alan and Gary – “see you Wednesday” – and prepared myself for the wintry scene outside. On the ten minute walk back to my car, through the car park, over the roundabout and up the hill, the hail continued to fall. Footstep after footstep was met with the crunch of ice underfoot. In all of my years of supporting Chelsea in person, all nine hundred and twelve games, I don’t think I’d every encountered such a wretched walk back to a waiting car. I truly pitied the poor souls who faced a thirty minute walk back to the train station. Despite being stuck in traffic for a while, I eventually pulled away and soon found myself heading east. The hail had turned to torrential rain. Oh fun, fun, fun. As I drove past Port Talbot, the array of lights at the steel works cut into the night. The plumes of smoke still billowed heavenwards. Then, the explosion of light as several lightning flashes lit up the entire sky. This was turning out to be some day in deepest, darkest South Wales. To add to the drama, fireworks – ahead of Monday’s Firework night – lit up the sky too. I found the driving to be rather tiring, but I wanted to get home. No coffee stops, no respite. I got the cheapest of thrills as my headlights lit up a road sign. I was in no mood to listen to the football on the radio. Music accompanied me on the two and a quarter hour journey back to Somerset. It was only as I was nearing my end destination that I flicked on “Five Live.” There was a small amount of consolation in the fact that Spurs had lost at home to Wigan and that Manchester City had only drew at West Ham. United’s win meant that we had slipped down to second place, but we are still conveniently placed. On Wednesday, we have a must-win game against Shakhtar Donetsk in the Champions League. On Sunday, we meet Liverpool at Stamford Bridge in the Premier League.